Connecticut becomes the eighth U.S. state to make it easier for transgender citizens to obtain documents that reflect their authentic gender. 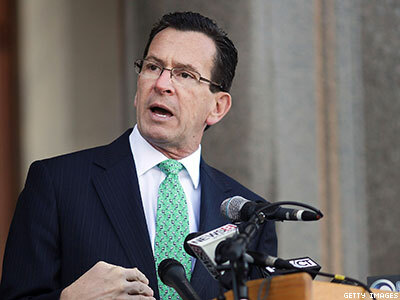 Connecticut Governor Dannel Malloy last week signed a new law making it easier for transgender people to obtain updated birth certificates that reflect their authentic gender. Passed overwhelmingly through the state's Senate and House, the bill struck down a long-standing stipulation recommended by the Department of Health that required trans citizens provide "proof" of gender-affirming surgery before being able to legally change the gender marker on this critical identifying document, Gay & Lesbian Advocates and Defenders announced in a press release. Under the new law, according to a newly released GLAD "Know Your Rights" birth certificate toolkit, trans people can now submit a notarized affadvit declaring that, "I have undergone appropriate treatment for the purpose of gender transition based on contemporary clinical standards, and that I am no longer the gender recorded on my current birth certificate." This statement must be accompanied by an affadavit from a doctor declaring that the petitioner has undergone "surgical, hormonal or other treatment." "This is a critically important advance for Connecticut's transgender citizens," said Jennifer Levi, director of GLAD's Transgender Rights Project in a statement. "When transgender people cannot obtain identity documents that match their gender identity, they become vulnerable to discrimination, harassment, and violence." As trans advocates cheered this "modernization," they also note that similar conclusions have been reached by legislators in at least seven other U.S. states — most recently, Hawaii — which have also eased surgical prerequisites for updating gender markers on birth certificates. Removing surgical barriers to obtaining accurate legal documentation has also become a worldwide issue, with parts of Canada as well as the nations of Turkey, Israel, and Taiwan recently relaxing surgery requirements for certain legal documents. Increasingly, groups like trans model Geena Rocero's Gender Proud and Transgender Europe have taken up the fight, arguing that forcing trans citizens to choose between gender recognition and potential sterilization — which occurs in gender-affirming surgeries that include genital reconstruction — is a human rights violation.